Royal British Legion Pilgrimage 2006. This July a pilgrimage was made to the Somme battlefields for people to visit the graves or memorials of relations or a distant unknown family member lost in the conflict. It was a truly memorable experience under the clear blue skies of Northern France. A short remembrance service held at Serre Road No. 2 cemetery with three Royal British Legion Standard Bearers.. The Webmaster with Henry Allingham before the 90th memorial service at Thiepval. 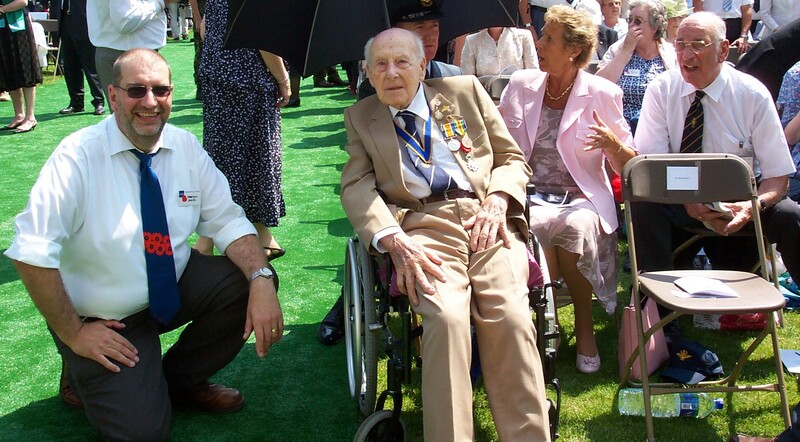 For 110 years old he was an inspiration and seemed to enjoy the service - even standing for the National Anthem! The traditional group photo in a cemetery on the Somme, remembering all the individual graves visited by the group over the four days..
A Great number of the Hunts. Cyclists were in the battle of the Somme and many are still lying beneath the shadow of a white Portland stone cross and the simple altar. The sad thing for the ones that I had spoken to is that, unlike the Pals Battalions, they were not allowed to fight as one unit, but split into over 30 differing Regiments and units. As such they were recorded in history as being from 'other Regiments' and not Hunts. Cyclists. This is not always the case as there are a few 'mistakes' two of their names are on the Thiepval Memorial as 'Hunts. Cyclists'. It is with short services like these held in the cemeteries that they are remembered.